While Santiago de Chile is not short of perfectly pleasant boutique hotels, few are truly audacious, which explains the anticipation surrounding the launch of Cumbres Lastarria. Earning attention as much for it location – on a charming meandering street in the boho district of Lastarria – as for its disruptive design, courtesy of local architect and proprietor Rodrigo Errázuriz, the 70-room hotel is quickly becoming the place to be seen for hip locals and international visitors alike. Inside, design duo Enrique Concha and Andrés Martínez continued with the property’s contemporary theme, while championing Chilean heritage, mixing bespoke modern furnishings with old-style accents. 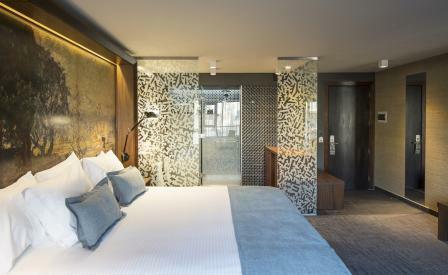 ‘We conceived the hotel as a contemporary extension of the neighbourhood, which is an entertaining area full of surprises, with a busy public, historical and culture life,’ say the pair. Contrary to the outlandish exterior, guest rooms are plush affairs, with decorative headboards that display replica paintings once created by national masters who used the area for inspiration. Head to the 8th floor, where a heated swimming pool and a Mediterranean restaurant offer breathtaking views over Forestal Park, San Cristóbal Hill and downtown Santiago.